You can’t always judge a record by its cover. You can’t judge a movie by its poster, either. In the wake of Shaft’s 1971 success, a wave of films known as “blaxploitation” hit the theaters. They featured pimps, hustlers, drug dealers, prostitutes, bad karate and worse acting. In short, they are wonderful. We have the blaxpoitation genre to thank for Pam Grier, Rudy Ray Moore, and Antonio Fargas. Quentin Tarantino owes the genre a huge debt. On its surface, The Spook Who Sat by the Door looks like any other blaxploitation flick. There’s The Man who says things like “those people make great athletes,” “I’m the best friend those people have in Washington!” and “This is no place for misplaced cotton pickers.” There’s judo, black militancy, prostitutes. There’s that horribly offensive title. But the film is so much more than that. “Spook” here means both spy and African-American. Protagonist Dan Freeman is the CIA’s first token hire, an agent put in charge of the copy machine. “We can put him out in reception. All our visitors could see we are integrated,” says The Man, and there’s your title. Take a look at that album cover, though. Freeman doesn’t sit idly by the door. The three things that make for a great blaxploitation-era film are, in no particular order: pimp suits, Antonio Fargas, and a funky soundtrack. There’s no Antonia Fargas here, but there’s plenty of funk. 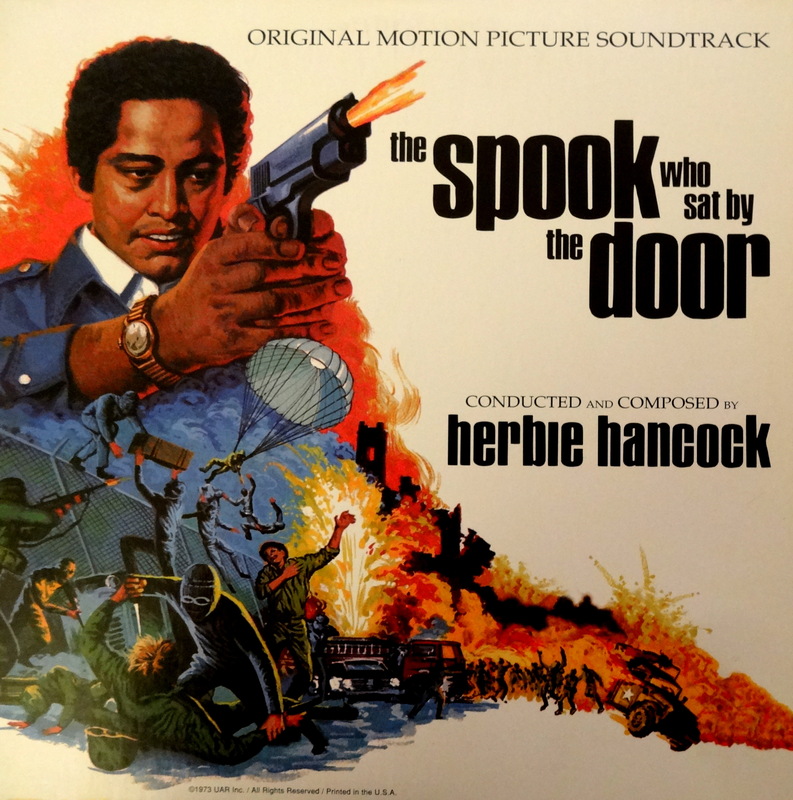 Herbie Hancock recorded and released the Head Hunters album right around the same time as the film’s soundtrack. Together the two mark the jazz pianist’s move from a straighter jazz sound to funk, a transition that would reach its apex with 1983’s “Rockit.” There’s still plenty of jazz here, though. The soundtrack is nowhere near as funky as Curtis Mayfield’s Super Fly, but if this rhythm section doesn’t do it for you consult your doctor. You might be in need of a funk transplant. The book upon which the film was based remains in print. The movie itself was long out of print, but you can pick that up on DVD now, too. As for the soundtrack: to my knowledge it was never re-released on CD, but come on — you don’t want a cruddy CD anyway. Keep an eye out for a vinyl copy so that you can stare lovingly at that badass album cover while you spin the record. It should only run you about 15 bucks or so. Happy hunting. “The Mayor’s office is now air conditioned, courtesy of the Black Freedom Fighters of Chicago.” – That line made my damned morning, and now I want to see this movie. (Lord, those ’70’s movie trailer voice overs, sounding like they were coming out of drive in theatre speakers). But this one time he tossed the two tickets to my mother, who decided she would take me to see “Blacula” before it hit the unwashed masses, I KNOW i’ve made you all jell on that one. It’s doesn’t quite have the funk….but c’mon….”young nubile bodies satisfying his hunger”……I WAS NINE! !